Popovers Bake at 450 F for 15 min. then at 350 " 20 min. 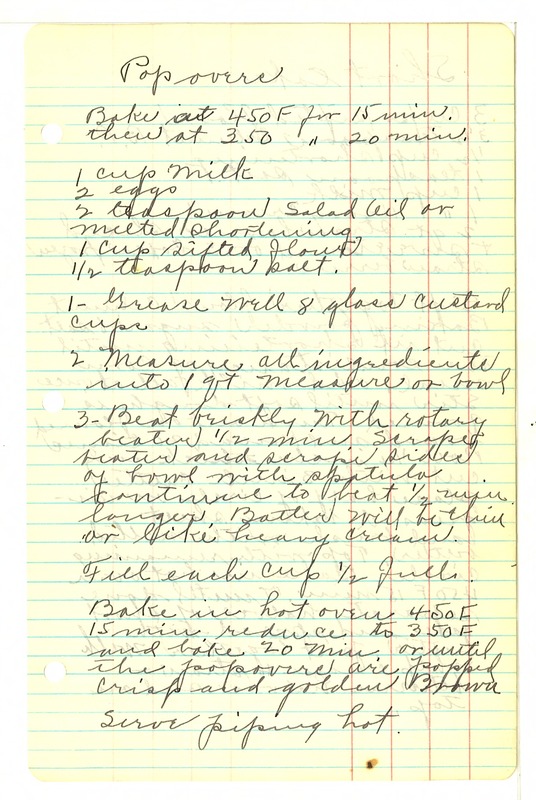 1 cup milk 2 eggs 2 teaspoon Salad Oil or melted shortening 1 cup sifted flour 1/2 teaspoon salt. 1- Grease well 8 glass Custard cups 2 Measure all ingredients into 1 qt measure or bowl 3- Beat briskly with rotary beater 1/2 min. Scrape beater and scrape sides of bowl with spatula continue to beat 1/2 min longer. Batter will be thin or like heavy cream. Fill each cup 1/2 full Bake in hot oven 450 F 15 min reduce to 350 F and bake 20 min or until the popovers are popped crisp and golden Brown Serve piping hot.